I think it is build date related. From what I have researched, trucks built after the first of the year have HUD that shows audio and phone, those before do not. Just checking. Do you also get phone information displayed on the HUD with an incoming call? Thanks. That looks sweet. 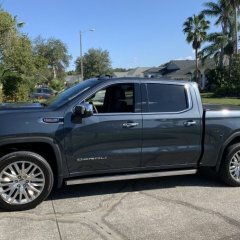 I have a 2019 Denali and was contacted to do a test 3” lift and want to do new wheels and tires and this helps with sizing. I’m curious as to max size tires I can get with 22s. Would you mind posting a picture off angle or off to the side? That really looks nice and it would help me also with tire size! I tried GMC customer service also. They referred me back to the dealer and said not all trims would show the same things. I said I have a Denali Ultimate and every option should be on this trim. I am going to check wit the dealer again but doubt anything will come from it. I almost bet (but I seriously hope not) that it will never work as it is supposed to. They advertise and sell features they don’t deliver. Does anyone know if there is a way to darken the Navigation at night time? It is extremely distracting. Have a new Sierra Denali Ultimate purchased in November after trading in my 2016 Denali. Does anyone know how to turn on the tachometer, audio info, and phone info on the heads ups display? We have a Yukon that displays all of that and GMCs website says all of those can be displayed (see picture). Will this be a software update and the additional functionality is coming? I also would love if the navigation screen could have more contrast and not be so gray at night time driving. It is like there is no customization at al.